Nicole Kidman, Lucas Hedges, Joel Edgerton, and more unite against LBGTQ bullying. 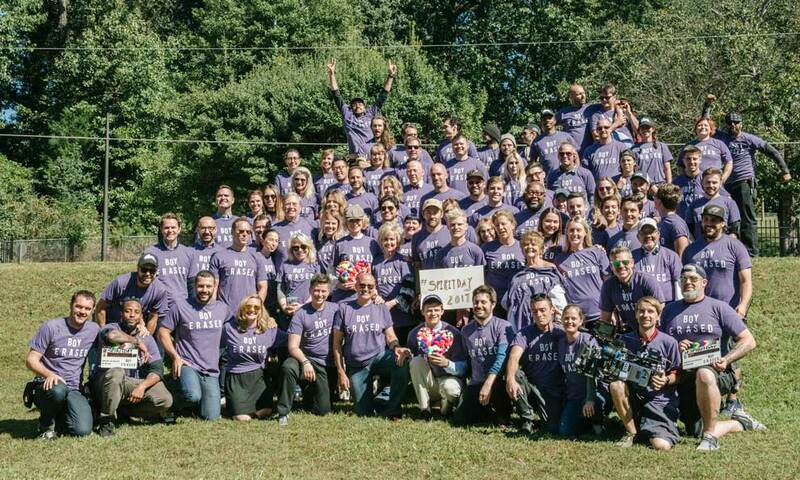 The cast and crew of Boy Erased celebrated national Spirit Day today on set in Atlanta, Georgia by wearing purple with others around the world to speak out against LGBTQ bullying and support LGBTQ youth. The cast and crew––including Academy Award nominee Lucas Hedges , Academy Award winner Nicole Kidman, and Joel Edgerton––took a break from filming to “go purple” in a group photo with the film’s real-life family Garrard and Martha Conley, portrayed by Hedges and Kidman in the film. Garrard Conley’s memoir Boy Erased: A Memoir of Identity, Faith, and Family about his time at conversion therapy camp is the basis for the film. Set to come out next fall on September 28, 2018, Boy Erased will tell the story of Jared (Hedges), the son of a Baptist pastor in a small American town, who is outed to his parents (Kidman and Russell Crowe) at age 19. Jared is faced with an ultimatum: attend a gay conversion therapy program––or be permanently exiled and shunned by his family, friends, and faith. Boy Erased is the true story of one young man’s struggle to find himself while being forced to question every aspect of his identity. For more information on #SpiritDay, visit GLAAD. Kidman, Edgerton, and Hedges take part in Spirit Day by wearing purple alongside real-life Garrard Conley (right of Hedges) and mom Martha (right of Kidman).